If you’ve been following my blog, you might know that I have a love for the new wing of Plaza Singapura, what with 2 satisfying meals at Hoshino and Hifumi previously. Nana’s Green Tea is a newer-comer to the Japanese food scene in PS which I’ve been eyeing on so boy was I excited to finally have a good opportunity to taste their food. I’ve heard bloggers raving about the Salmon Carpaccio ($8.80) so I knew I had to get my teeth sinking into them. 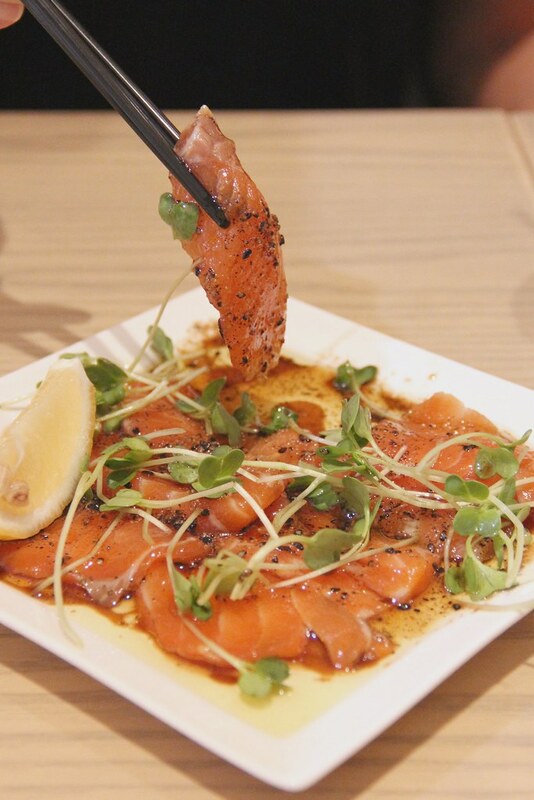 The tender slices of salmon are served as an appetizer which was a great start to our meal. Drizzled heavily with sesame sauce, it became an addictive plate of sashimi-like goodness. 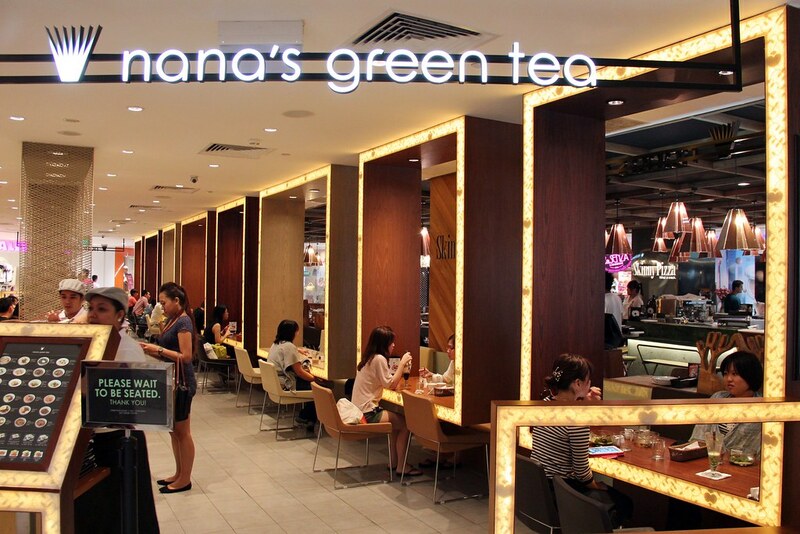 I find it interesting that from green tea drinks and desserts to non-green tea food, Nana’s Green Tea serves them in quality and not just quantity. I find it even more pleasing that with such appetizing mains and sides they come with an affordable price tag. The Salmon Udon with Cream Sauce ($14.80), unlike the usual udon, is one served in a creamy soup base, reminding me of the creamy carbonara. Yet, the cream sauce used here is thinner and healthier compared to the rich cream of spaghetti which can make us sick of it at times. 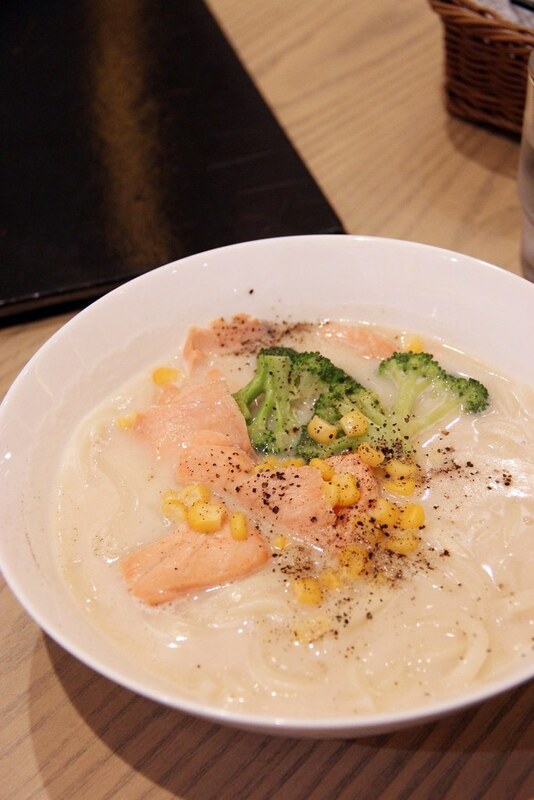 Coupled with cooked salmon slices, corn and broccoli, the udon was rather light on the tastebuds and certainly not too thick to my liking. I’m even starting to prefer cream udons to plain ones. Another well-liked dish we had that day would be the Chicken Cutlet Curry Don ($13.80). 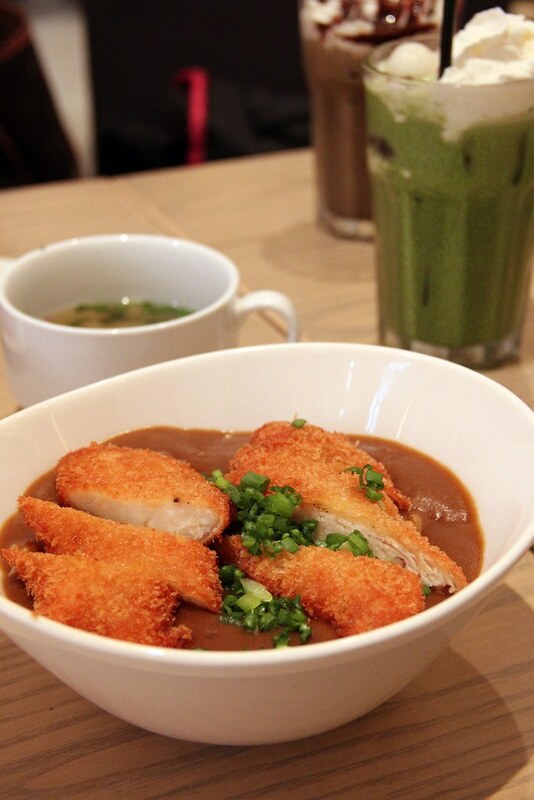 It’s thick, succulent slabs of chicken nicely breaded and fried, eaten together with thick Japanese curry was a warm comfort which had us going back to the bowl for more. 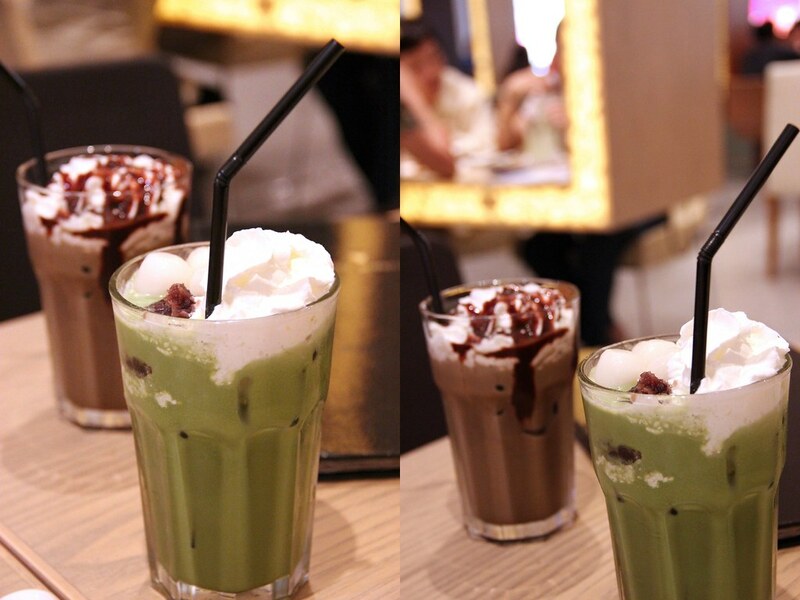 When it comes to green tea, I’ve slowly became a huge fan of their dessert versions. 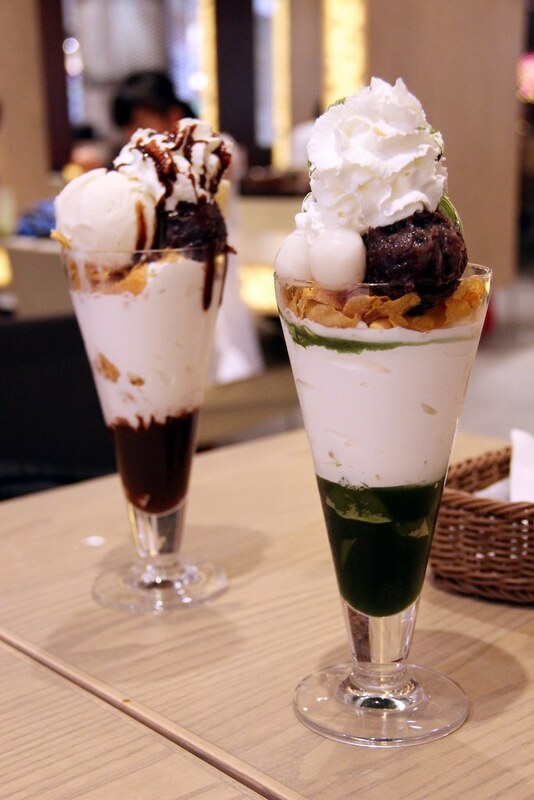 I’m happy to see the variety of desserts served here, from tall glasses of parfaits to small bowls of jelly with green tea. 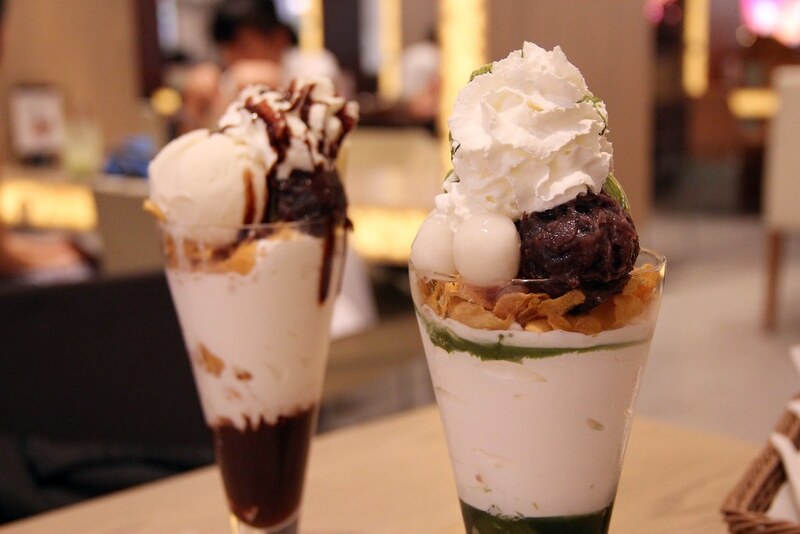 Of all, the parfaits appeared rather tempting to me so I went ahead with the Matcha Shiratama Parfait ($11.80) and Banana Chocolate Parfait ($12.80). I liked how the scoop of green tea ice cream on the matcha parfait was not too sweet, considering that the layer of vanilla ice cream in the middle was sweet enough. Furnished by wooden frames which separates one table from the next, an intimate, cosy corner is available for diners. You get to spend quality time with your family and friends and the food gets to be shared (since they are filling). Let’s not forget the fact that the food are at comfortable prices. Special thanks to Nana’s Green Tea and Diana from Publicist PR for the invite. Looks good! Especially that Salmon Carpaccio. I need to find some time to go down. Lol. Yup yup the salmon was my favorite dish that day instead of the green tea (haha)! seeing quite a few Japanese cafes have opened in Singapore recently. If you enjoy them, you should check out Maccha House and Tsujiri too. Thanks, will check them out when I get to! Are they equally good? Maccha House is cheaper. However for their soft-serve maccha ice cream for example, my friend enjoys Maccha House’s more because it has less maccha content and less bitter, while Tsujiri’s is thicker,richer and more like a gelato. I personally enjoy Tsujiri’s more but my friend found it to be too thick for his liking.